A 6" round cake surrounded by a dozen cupcakes (CBD). Cake is the same flavor as cupcakes. Writing on cake is included. Who isn't the cupcake type!! But if you aren't, we have yummy sheet cakes available. These delicious cakes come in all of our Cupcake By the Dozen creations. Writing on cake is included. 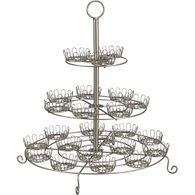 Our cupcake towers are a great way to display our beautiful cupcakes. 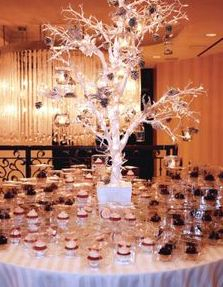 Towers can be customized to suit any occasion. 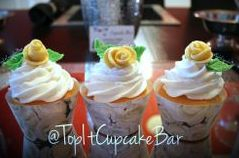 They come as small or as large as you like to accommodate regular size cupcakes, mini cupcakes or a combination of both sizes. Rent a tower for your next event. Great as centerpieces as well. Whether your hosting a baby shower or having a wedding, a cupcake as a favor is a great way to show your appreciation or gratitude to guests. We individually package and display our cupcakes in a small box, creating a sweet memory of your special day that everyone can go home with. Add a ribbon and/or a personalized message. Our 'Cupcake Bar in a Jar' are great favors as well. 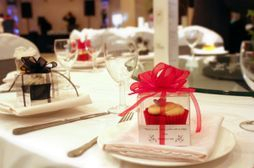 When setting up a table, include a cupcake on everyone's place setting. It's a unique touch to display creativity at a small dinner party for 4, to a family reunion for 100. 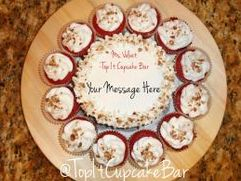 Dress up your cupcake and accent the party with a cupcake wrapper. A simple color or a unique design can enhance and take any cupcake and display to the next level. 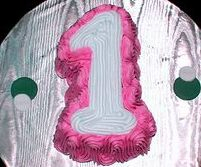 One of the top trends for first birthday parties is a smash cake. 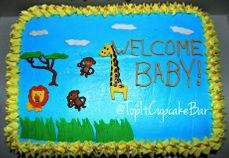 A smash cake is a small cake made especially for the birthday baby to smash, smear, enjoy and eat (remember to take lots of photos for the album & spread newspaper!). 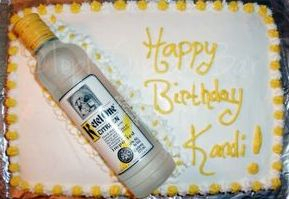 Bottle & Cake... that's all you need to get the party started! This is great for all types of +21 parties including but not limited to birthday's, cocktails, housewarming, New Years Eve and even divorce parties. Your choice of liquor! 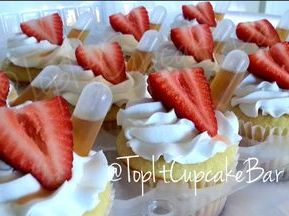 A pipette filled with liquid to compliment our adult cupcakes. You can either squeeze the cake shot into your mouth then eat the cupcake, or squeeze it into the cupcake and enjoy! When ordering Adult Creations, you have the option to add this to your order. Now available with Regular Creations! *All payments are made via Paypal (credit or debit). No cash accepted unless additional fees occurred during delivery. *Addition fees may be added depending on difficulty of delivery, (pay to park, hospital, etc.) custom order, distance, etc & will be due at time of payment/delivery. *Free delivery for all orders $100 and over! *Delivery times are between 10am to 7pm. *Rush & after hour delivery rates vary in price. *We accept cash & credit (via PayPal Here) for all additional fees at the time of delivery. the order within 30mins of delivery time.